The largest survey of Ukrainian consumer preferences in 2017 within the framework of the annual Favourites of Success rating announced the results of the voting for the best brands. The contest of the Favourites of Success trademarks summed up the survey of Ukrainian consumer preferences made during 2017 in order to determine the best Ukrainian market brands that are the most recommended by experts and the most favourite among consumers. 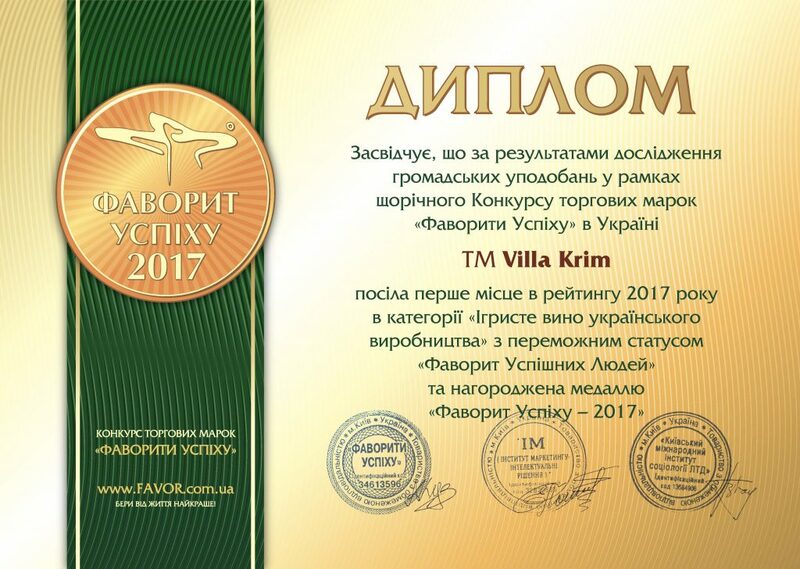 TM Villa Krim was named the best of all the market participants in the category “Sparkling wine of Ukrainian production”. A characteristic feature of the project is that the rating of the Favourites is made by not only the votes, consumer reviews and expert recommendations, but also by feedback from representatives of the Ukrainian show business. For example, this year, “star votes” for the Favourite were left by Gaitana singer, Olena Garbuz opera diva, Irina Trukhacheva TV presenter and many other celebrities. The wine that won the award is a reflection of an exceptional work of the company’s winemakers and technologists. Since 2012, Villa Krim brand, liked by millions of people, has been steadily offering the Ukrainian consumers a wide range of wines having consistently high European quality, remaining one of the leaders by recommendations among consumers. An independent rating of brand popularity at www.favor.com.ua offers visitors to vote online or monitor the level of consumer confidence in trademarks, goods and services of the Ukrainian market.